Shri Sarveshwar Singhji was Senapati (Military General) of Raja Man Singh I of Amer who had come to conquer Bengal when Emperor Akbar granted Subahdari of Bengal, Bihar and Orissa to Raja Man Singh.He together with the rajput infantry and cavalry invaded the deep forest region in Bengal known as Jungle Mahal.The region was popularly ruled by the local Mal chieftains who were defeated and vanquished by the rajputs. Hence he assumed the title “Malla Dev” which became part of the name and style of his descendants. 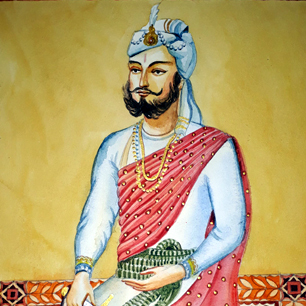 Sarveshwar Singhji belonged to the Chauhan clan of Rajputs from Fatehpur Sikri in Rajputana. As a reward, Raja Man Singh I of Amer, granted mansabdari of the entire region of Jungle Mahal to his victorious Senapati Sarveshwar Singhji under suzerainty and subordination as a tributary vassal state to the Mughal Emperor Akbar. He named his new capital Jhargram which means a village surrounded by deep forests and fortified his kingdom with a canal-ed fort known as “Ugal” in local language, respectfully the title of “Ugal Sanda” (Lord of thee Fort) was conferred to the Raja and his successors. 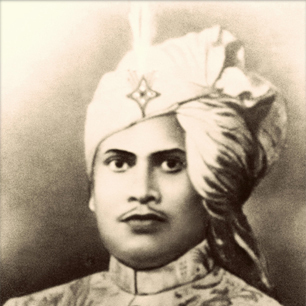 Raja Ananda Malla Ugal Sanda Deb, 9th Raja of Jhargram, he introduced a number of administrative changes during his regain a new land revenue system was introduced which initiated the growth of agriculture and forestry. Several Hindu festivals like Indra puja, Dol purnima, Rath yatra and Gajan were celebrated with great pomp and splendor. Raja Man Govind Malla Ugal Sanda Deb, 10th Raja of Jhargram (1741-1772), succeeded to the gaddi and ruled his dominions from his capital in Jhargram. He unified all Rajput kingdoms in Bengal against the campaign of Marathas. Between 1741-1751, he fought three successful battles against the Maratha invasion alongside the Raja of Bishnupur and the Nawab of Bengal and consolidated control over the kingdom making himself a dominant king in the western part of Bengal. Raja Vikramjit Malla Ugal Sanda Deb, 11th Raja of Jhargram (1772-1806). He was a pious and charitable king and served for the welfare of his subjects. He realized that the British were a new kind of threat to his kingdom so worked on to check the advances of the British by allying with the Raja of Dhalbhum and the Nawab of Bengal. He defeated Colonel Fergusson at Dudhkundi near Kharagpur in 1791 when the East India Company tried to enter Jhargram. Fergusson’s forces, consisting of 100 Europeans, 300 cavalry, 1400 sepoys and 10 field pieces, was the standard size of the colonial armies. But the second time the joint forces were defeated at Radhanagar by the British army in 1793, ending thereby the last hurdle to the colonial conquest of Bengal, hence the treaty of Midnapore confirmed the surrender of Jhargram to the British. But soon the British Governor of Bengal endorsed his stature and recognized Jhargram as a Zamindari estate as a permanent settlement. Raja Shyam Sundar Malla Dev, 12th Raja (1806-1832) was the eldest son of Raja Vikramjit Malla Dev. He became the ruler of Jhargram in 1806 in a simple coronation ceremony. He was a pious and charitable king and served for the welfare of his subjects. 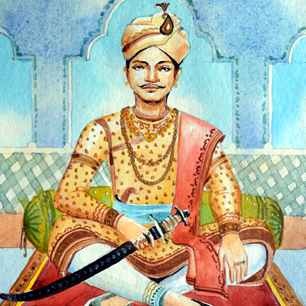 Raja Raghunath Malla Dev, 14th Raja was benevolent and a progressive king, throughout his reign he was genuinely focused towards the welfare of his subjects. He was portrayed as great in wisdom and also an extra ordinary wrestler, one can witness many of his wrestling instruments kept in the Palace and Calcutta museum. Raghunath Malla Dev commenced western education at Scotish Church College in Midnapore, and was the first degree holder from the region. He established an English primary school in the Palace on 5th October 1899 so that the young generation could be exposed to Western education in Jhargram.He welcomed industrialization and encouraged several British and Indian businessmen to setup industries in his kingdom.With the help of the British he introduced effective forestry and setup timber trading business and also built the Jhargram Railway Station for the Bengal Nagpur Railways which made Jhargram well connected to Calcutta and Bombay. Raja Sir Narasingha Malla Dev, OBE, KBE, 16th Raja of Jhargram 1929-1976. He was born on 22nd January, 1907 and passed away on 11th Navember, 1976). He was educated at Midnapore Collegiate School and Presidency College in Calcutta; conferred with O.B.E. (Order of British Empire) and K.B.E (Knight Commander of the Order of the British Empire). He inherited keen interest in music from the family and had deep knowledge of Vaishnav Sangeet, a skilled photographer and Life Member of Royal Photographic Society, London he won many international awards for his work.Raja Narasingha was also a great sports enthusiast, during his era abundant funds were allotted and sanctioned every year for development of sports in Jhargram. He also bore all expenses to commission the Midnapore Club and Sri Aurobindo Sports Stadium in Midnapore. Raja Bahadur served as Member of Legislative Council of Bengal and Member of Parliament. He donated wealth and land towards welfare causes of his subjects and poor farmers, making him the single largest land donor in West Bengal, he also worked towards rehabilitation of refugees during the partition of India. In Midnapore, he founded the Tuberculosis Chest Clinic and the Homeopathic College, and gave donations for the construction and purchase of books for Vidyasagar Memorial Library. His beneficiaries ranged from the Kolkata Bangiya Sahitya Parishad to New Delhi Kali Bari. He Married in 1930 to Rani Binode Manjari Devi daughter of Lal Saheb Girish Chandra Bhanj Deo of Mayurbhanj. 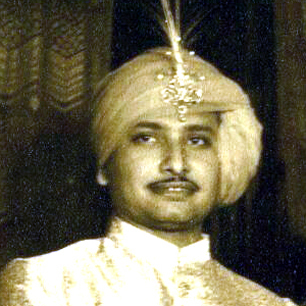 Raja Birendra Bijoy Malla Dev, 17th Raja of Jhargram 1977-2000. He was a guardian of the the royal family of Jhargram. He was educated at Midnapore College and Presidency College in Calcutta, elected two times to Member of Legislative Assembly; a talented cricketer who captained the school and university cricket teams; he was twice the winner of the Best Legislator award in the West Bengal legislative assembly; District President Indian National Congress Party and Founder President of Rotary Club of Jhargram. Life member of Cricket Association of Bengal. Raja Birendra was an eminent industrialist who owned businesses in Calcutta and Midnapore and was the first Raja in eastern India to convert his Palace into a heritage hotel. He married in 1953 to Rani Indira Devi daughter of HH Maharaja Shri Sudhanshu Shekhar Singh Deo of Sonepur.